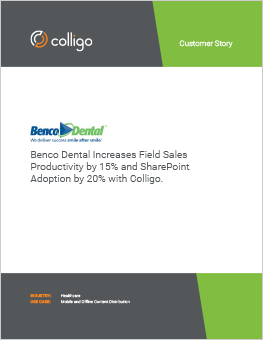 SharePoint Mobile | SharePoint Case Studies | Benco Dental | Colligo Networks inc.
Benco offers a large variety of services: dental supplies, equipment, dental consulting, and equipment services to more than 30,000 dental professionals in all 50 states. Benco Dental has over 50 regional showroom locations and 5 distribution centers that service over 30,000 dental professionals across America. Increased customer satisfaction by responding more rapidly to dentists’ questions. Improved sales productivity by 15%, by enabling them to respond on-site, cutting the need for follow-up time back at their desks. Broadened SharePoint adoption by 20%, by enabling sales to access their sales collateral on the road and offline. Benco wanted to improve customer satisfaction by having a quicker response time to dentists’ questions and requests for information. Benco’s 450 sales representatives are on a tight schedule, typically visiting a dozen dental offices a day. Each dentist will have numerous questions and requests for manufacturer’s materials, and very little time to spare. Sales representatives had to wait until they were back in the office and online to respond to these inquiries. Benco needed a way to enable sales reps to access the most current version of materials immediately from their iPads, even when offline. Benco was already a dedicated SharePoint user, so it made sense to store and organize the sales materials in SharePoint. Since Benco’s sales representatives predominantly use iPads, the ideal solution would enable easy iPad access to their SharePoint sales content. With 2,000 manufacturers’ documents, videos, and 3GB of data, it was vital to be able to quickly locate the correct document and be sure that it was the latest version. To quickly find the correct document, it was not enough to simply search on the document name. A solution that allowed for searching on metadata with keywords was an essential requirement. Benco sales materials are continually changing; with the introduction of new products, pricing, and catalogues, attaching expiration dates to documents was critical as well. After evaluating several SharePoint mobile clients, Benco selected Colligo. “We searched for a solution that would enable mobile access to SharePoint, even when offline. Our sales guys are on the road at dental offices and will frequently be offline, so that was essential. Some solutions just didn’t work offline. Others would only allow us to search on the document name and not on the metadata. Colligo met all our criteria in an easy to use iPad app,” says Terry Barrett, VP of Information Technology at Benco Dental. Benco created a dedicated sales community on SharePoint called Salesbox, with Benco branding, containing all the dental suppliers’ sales collateral, Benco corporate videos, and company magazines. Now, sales associates can respond immediately to dentists’ questions, with equipment datasheets, catalogs, and pricing. “Sales no longer have to say, ‘I’ll get back to you with that.’ Now they simply bring it up on their iPad for the dentist to see and then email the documents — all before leaving the dental office,” said Terry. Benco chose Colligo to give their sales team access to the most current sales materials while out on the road visiting dental offices. Colligo automatically syncs content, giving sales easy offline access to the latest sales collateral from their iPads and iPhones.